Proprietary Name: Clopidogrel What is the Proprietary Name? Non-Proprietary Name: Clopidogrel Bisulfate What is the Non-Proprietary Name? Clopidogrel with NDC 70518-1898 is a a human prescription drug product labeled by Remedyrepack Inc.. The generic name of Clopidogrel is clopidogrel bisulfate. The product's dosage form is tablet, film coated and is administered via oral form. FDA Application Number: ANDA090540 What is the FDA Application Number? 12 inhibitor in patients identified as CYP2C19 poor metabolizers. Clopidogrel tablets are indicated to reduce the rate of myocardial infarction (MI) and stroke in patients with non-ST-segment elevation ACS (unstable angina [UA]/non-ST-elevation myocardial infarction [NSTEMI]), including patients who are to be managed medically and those who are to be managed with coronary revascularization. Clopidogrel tablets should be administered in conjunction with aspirin.Clopidogrel tablets are indicated to reduce the rate of myocardial infarction and stroke in patients with acute ST-elevation myocardial infarction (STEMI) who are to be managed medically. Clopidogrel tablets should be administered in conjunction with aspirin. In patients with established peripheral arterial disease or with a history of recent myocardial infarction (MI) or recent stroke clopidogrel tablets are indicated to reduce the rate of MI and stroke. 75 mg tablets: Pink colored, round, biconvex, beveled edge, film-coated tablets debossed with ‘E’ on one side and ‘34’ on the other side. Clopidogrel tablets are contraindicated in patients with active pathological bleeding such as peptic ulcer or intracranial hemorrhage. Thienopyridines, including clopidogrel bisulfate, increase the risk of bleeding. Thienopyridines inhibit platelet aggregation for the lifetime of the platelet (7 to 10 days). Because the half-life of clopidogrel’s active metabolite is short, it may be possible to restore hemostasis by administering exogenous platelets; however, platelet transfusions within 4 hours of the loading dose or 2 hours of the maintenance dose may be less effective. Discontinuation of clopidogrel bisulfate increases the risk of cardiovascular events. If clopidogrel bisulfate must be temporarily discontinued (e.g., to treat bleeding or for surgery with a major risk of bleeding), restart it as soon as possible. When possible, interrupt therapy with clopidogrel bisulfate for five days prior to such surgery. Resume clopidogrel bisulfate as soon as hemostasis is achieved. Clopidogrel bisulfate has been evaluated for safety in more than 54,000 patients, including over 21,000 patients treated for one year or more. The clinically important adverse reactions observed in trials comparing clopidogrel bisulfate plus aspirin to placebo plus aspirin and trials comparing clopidogrel bisulfate alone to aspirin alone are discussed below. In CURE, clopidogrel bisulfate use with aspirin was associated with an increase in major bleeding (primarily gastrointestinal and at puncture sites) compared to placebo with aspirin (see Table 1). The incidence of intracranial hemorrhage (0.1%) and fatal bleeding (0.2%) were the same in both groups. Other bleeding events that were reported more frequently in the clopidogrel group were epistaxis, hematuria, and bruise. In COMMIT, similar rates of major bleeding were observed in the clopidogrel bisulfate and placebo groups, both of which also received aspirin (see Table 2). p-value* Major bleeds were cerebral bleeds or noncerebral bleeds thought to have caused death or that required transfusion. CAPRIE (Clopidogrel Bisulfate vs Aspirin)In CAPRIE, gastrointestinal hemorrhage occurred at a rate of 2% in those taking clopidogrel bisulfate versus 2.7% in those taking aspirin; bleeding requiring hospitalization occurred in 0.7% and 1.1%, respectively. The incidence of intracranial hemorrhage was 0.4% for clopidogrel bisulfate compared to 0.5% for aspirin. Other bleeding events that were reported more frequently in the clopidogrel bisulfate group were epistaxis and hematoma. Other Adverse EventsIn CURE and CHARISMA, which compared clopidogrel bisulfate plus aspirin to aspirin alone, there was no difference in the rate of adverse events (other than bleeding) between clopidogrel bisulfate and placebo. In CAPRIE, which compared clopidogrel bisulfate to aspirin, pruritus was more frequently reported in those taking clopidogrel bisulfate. No other difference in the rate of adverse events (other than bleeding) was reported. The following adverse reactions have been identified during postapproval use of clopidogrel bisulfate. Because these reactions are reported voluntarily from a population of an unknown size, it is not always possible to reliably estimate their frequency or establish a causal relationship to drug exposure. Hemorrhages, including those with fatal outcome, have been reported in patients treated with clopidogrel bisulfate.
. Consider the use of a parenteral antiplatelet agent in acute coronary syndrome patients requiring coadministration of morphine or other opioid agonists. Coadministration of clopidogrel bisulfate and NSAIDs increases the risk of gastrointestinal bleeding. in vitro, clopidogrel inhibits CYP2C9. The acyl-β-glucuronide metabolite of clopidogrel is a strong inhibitor of CYP2C8. Clopidogrel bisulfate can increase the systemic exposure to drugs that are primarily cleared by CYP2C8, thereby needing dose adjustment and appropriate monitoring.
. Avoid concomitant use of repaglinide with clopidogrel bisulfate. If concomitant use cannot be avoided, initiate repaglinide at 0.5 mg before each meal and do not exceed a total daily dose of 4 mg. Increased frequency of glucose monitoring may be required during concomitant use. 2 basis, revealed no evidence of impaired fertility or fetotoxicity due to clopidogrel. Risk SummaryThere are no data on the presence of clopidogrel in human milk or the effects on milk production. No adverse effects on breastfed infants have been observed with maternal clopidogrel use during lactation in a small number of postmarketing cases. Studies in rats have shown that clopidogrel and/or its metabolites are present in the milk. When a drug is present in animal milk, it is likely that the drug will be present in human milk. The developmental and health benefits of breastfeeding should be considered along with mother’s clinical need for clopidogrel bisulfate and any potential adverse effects on the breastfed infant from clopidogrel bisulfate or from underlying maternal condition. Of the total number of subjects in the CAPRIE and CURE controlled clinical studies, approximately 50% of patients treated with clopidogrel bisulfate were 65 years of age and older, and 15% were 75 years and older. In COMMIT, approximately 58% of the patients treated with clopidogrel bisulfate were 60 years and older, 26% of whom were 70 years and older.
. No dosage adjustment is necessary in elderly patients. Platelet inhibition by clopidogrel bisulfate is irreversible and will last for the life of the platelet. Overdose following clopidogrel administration may result in bleeding complications. A single oral dose of clopidogrel at 1500 or 2000 mg/kg was lethal to mice and to rats and at 3000 mg/kg to baboons. Symptoms of acute toxicity were vomiting, prostration, difficult breathing, and gastrointestinal hemorrhage in animals. 4 and its molecular weight is 419.9. Clopidogrel bisulfate USP is a white to off-white powder. It is practically insoluble in water at neutral pH but freely soluble at pH 1. It also dissolves freely in methanol, dissolves sparingly in methylene chloride, and is practically insoluble in ethyl ether. It has a specific optical rotation of about +56°. 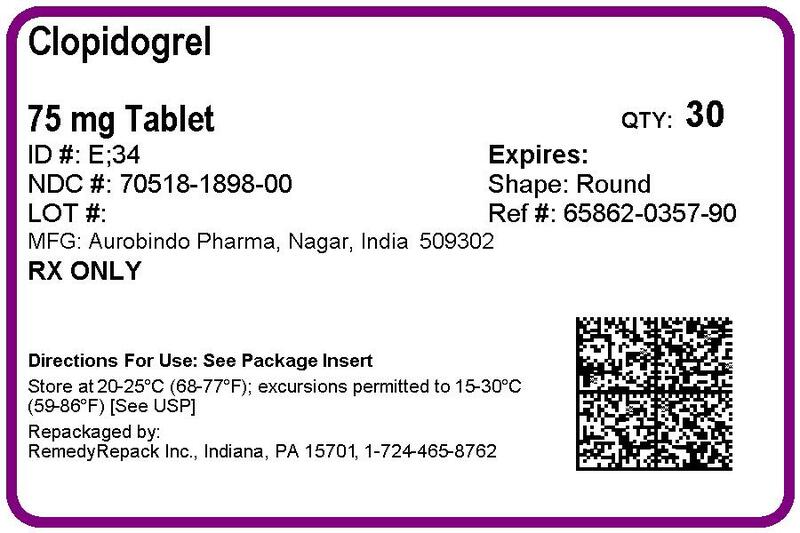 Clopidogrel tablets, USP for oral administration are provided as pink colored, round, biconvex, beveled edge, debossed, film-coated tablets containing 97.875 mg of clopidogrel bisulfate which is the molar equivalent of 75 mg of clopidogrel base. Each film-coated tablet contains crospovidone, hydrogenated castor oil, hydroxypropyl cellulose low substituted, hypromellose 15cP, iron oxide red, lactose monohydrate, mannitol, microcrystalline cellulose, polyethylene glycol 6000, titanium dioxide, and triacetin as inactive ingredients. 12 class of ADP receptors on platelets. 12 receptor and the subsequent ADP-mediated activation of the glycoprotein GPIIb/IIIa complex, thereby inhibiting platelet aggregation. This action is irreversible. Consequently, platelets exposed to clopidogrel’s active metabolite are affected for the remainder of their lifespan (about 7 to 10 days). Platelet aggregation induced by agonists other than ADP is also inhibited by blocking the amplification of platelet activation by released ADP. Dose-dependent inhibition of platelet aggregation can be seen 2 hours after single oral doses of clopidogrel bisulfate. Repeated doses of 75 mg clopidogrel bisulfate per day inhibit ADP-induced platelet aggregation on the first day, and inhibition reaches steady state between Day 3 and Day 7. At steady state, the average inhibition level observed with a dose of 75 mg clopidogrel bisulfate per day was between 40% and 60%. Platelet aggregation and bleeding time gradually return to baseline values after treatment is discontinued, generally in about 5 days. After repeated doses of 75 mg clopidogrel bisulfate per day, patients with severe renal impairment (creatinine clearance from 5 to 15 mL/min) and moderate renal impairment (creatinine clearance from 30 to 60 mL/min) showed low (25%) inhibition of ADP-induced platelet aggregation. After repeated doses of 75 mg clopidogrel bisulfate per day for 10 days in patients with severe hepatic impairment, inhibition of ADP-induced platelet aggregation was similar to that observed in healthy subjects. max. Similar results were observed when a clopidogrel bisulfate 300 mg loading dose was administered with a high-fat breakfast. Clopidogrel is extensively metabolized by two main metabolic pathways: one mediated by esterases and leading to hydrolysis into an inactive carboxylic acid derivative (85% of circulating metabolites) and one mediated by multiple cytochrome P450 enzymes. Cytochromes first oxidize clopidogrel to a 2-oxo-clopidogrel intermediate metabolite. Subsequent metabolism of the 2-oxo-clopidogrel intermediate metabolite results in formation of the active metabolite, a thiol derivative of clopidogrel. The active metabolite is formed mostly by CYP2C19 with contributions from several other CYP enzymes, including CYP1A2, CYP2B6 and CYP3A. The active thiol metabolite binds rapidly and irreversibly to platelet receptors, thus inhibiting platelet aggregation for the lifespan of the platelet. 14C-labeled clopidogrel in humans, approximately 50% of total radioactivity was excreted in urine and approximately 46% in feces over the 5 days post dosing. After a single, oral dose of 75 mg, clopidogrel has a half-life of approximately 6 hours. The half-life of the active metabolite is about 30 minutes. 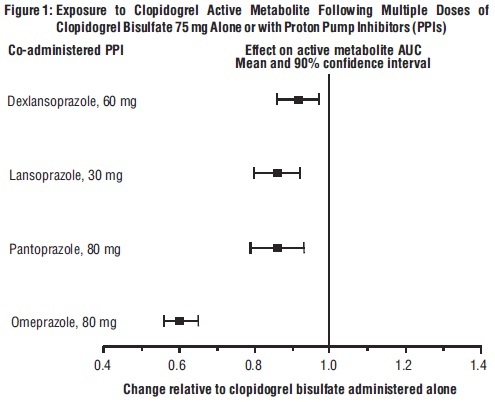 The effect of proton pump inhibitors (PPI) on the systemic exposure to the clopidogrel active metabolite following multiple doses of clopidogrel bisulfate 75 mg evaluated in dedicated drug interaction studies is presented in Figure 1.
max of clopidogrel’s thiol metabolites by 34%. Mean platelet aggregation was higher up to 2 to 4 hours with morphine coadministration. ex vivo platelet aggregation assays, differ according to CYP2C19 genotype. Patients who are homozygous for nonfunctional alleles of the CYP2C19 gene are termed “CYP2C19 poor metabolizers.” Approximately 2% of White and 4% of Black patients are poor metabolizers; the prevalence of poor metabolism is higher in Asian patients (e.g., 14% of Chinese). Tests are available to identify patients who are CYP2C19 poor metabolizers. § Vasodilator-stimulated phosphoprotein – platelet reactivity index; smaller value indicates greater platelet inhibition. in vivo test (micronucleus test by oral route in mice). Patients were randomized to receive clopidogrel bisulfate (300 mg loading dose followed by 75 mg once daily) or placebo, and were treated for up to one year. Patients also received aspirin (75 to 325 mg once daily) and other standard therapies such as heparin. The use of GPIIb/IIIa inhibitors was not permitted for three days prior to randomization. 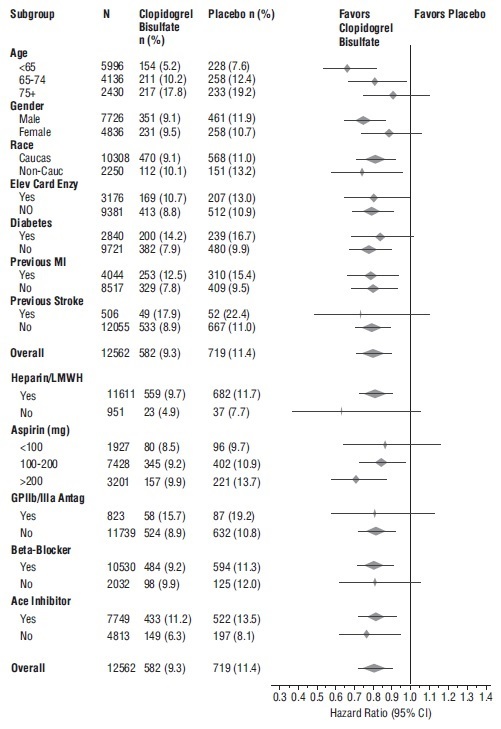 The number of patients experiencing the primary outcome (CV death, MI, or stroke) was 582 (9.3%) in the clopidogrel bisulfate-treated group and 719 (11.4%) in the placebo-treated group, a 20% relative risk reduction (95% CI of 10% to 28%; p < 0.001) for the clopidogrel bisulfate-treated group (see Table 4). The use of clopidogrel bisulfate in CURE was associated with a decrease in the use of thrombolytic therapy (71 patients [1.1%] in the clopidogrel bisulfate group, 126 patients [2%] in the placebo group; relative risk reduction of 43%), and GPIIb/IIIa inhibitors (369 patients [5.9%] in the clopidogrel bisulfate group, 454 patients [7.2%] in the placebo group, relative risk reduction of 18%). The use of clopidogrel bisulfate in CURE did not affect the number of patients treated with CABG or PCI (with or without stenting) (2253 patients [36%] in the clopidogrel bisulfate group, 2324 patients [36.9%] in the placebo group; relative risk reduction of 4%). In patients with STEMI, the safety and efficacy of clopidogrel bisulfate were evaluated in the randomized, placebo-controlled, double-blind study, COMMIT. COMMIT included 45,852 patients presenting within 24 hours of the onset of the symptoms of myocardial infarction with supporting ECG abnormalities (i.e., ST-elevation, ST-depression or left bundle-branch block). Patients were randomized to receive clopidogrel bisulfate (75 mg once daily) or placebo, in combination with aspirin (162 mg per day), for 28 days or until hospital discharge, whichever came first. 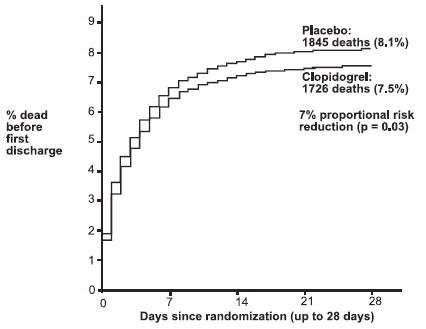 As shown in Table 5 and Figure 4 and Figure 5 below, clopidogrel bisulfate significantly reduced the relative risk of death from any cause by 7% (p=0.029), and the relative risk of the combination of re-infarction, stroke or death by 9% (p=0.002). Figure 4: Cumulative Event Rates for Death in the COMMIT Study**All treated patients received aspirin. * CI is 95% for Overall row only. The CAPRIE trial was a 19,185-patient, 304-center, international, randomized, double-blind, parallel-group study comparing clopidogrel bisulfate (75 mg daily) to aspirin (325 mg daily). To be eligible to enroll, patients had to have: 1) recent history of myocardial infarction (within 35 days); 2) recent histories of ischemic stroke (within 6 months) with at least a week of residual neurological signs; and/or 3) established peripheral arterial disease (PAD). Patients received randomized treatment for an average of 1.6 years (maximum of 3 years). The trial’s primary outcome was the time to first occurrence of new ischemic stroke (fatal or not), new myocardial infarction (fatal or not), or other vascular death. Deaths not easily attributable to nonvascular causes were all classified as vascular. 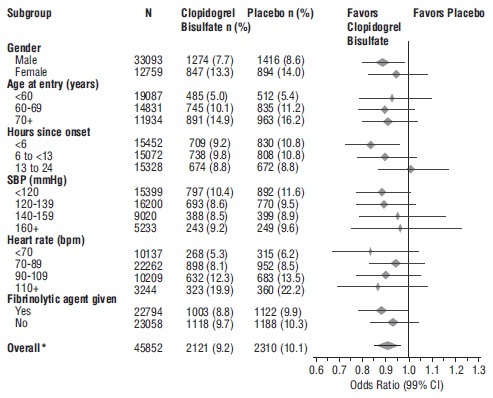 As shown in Table 6, clopidogrel bisulfate was associated with a lower incidence of outcome events, primarily MI. The overall relative risk reduction (9.8% vs. 10.6%) was 8.7%, p=0.045. Similar results were obtained when all-cause mortality and all-cause strokes were counted instead of vascular mortality and ischemic strokes (risk reduction 6.9%). In patients who survived an on-study stroke or myocardial infarction, the incidence of subsequent events was lower in the clopidogrel bisulfate group. 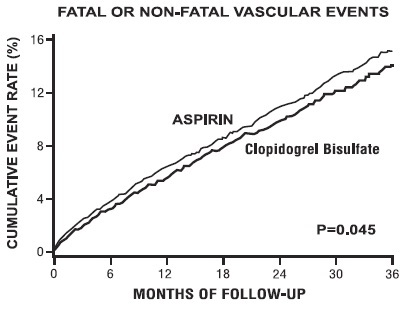 Figure 7: Fatal or Nonfatal Vascular Events in the CAPRIE StudyThe statistical significance favoring clopidogrel bisulfate over aspirin was marginal (p=0.045). 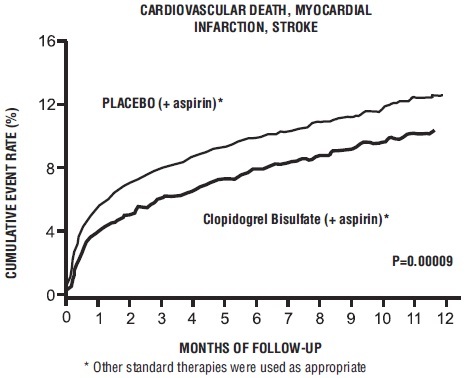 However, because aspirin is itself effective in reducing cardiovascular events in patients with recent myocardial infarction or stroke, the effect of clopidogrel bisulfate is substantial. The CAPRIE trial enrolled a population that had recent MI, recent stroke, or PAD. 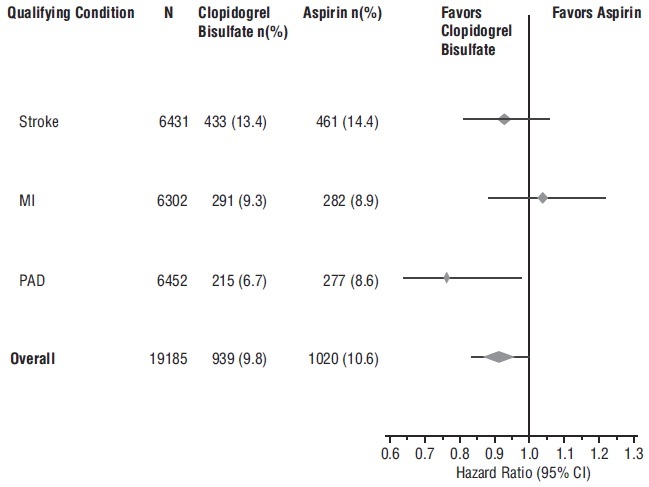 The efficacy of clopidogrel bisulfate relative to aspirin was heterogeneous across these subgroups (p=0.043) (see Figure 8). Nonetheless, this difference may be a chance occurrence because the CAPRIE trial was not designed to evaluate the relative benefit of clopidogrel bisulfate over aspirin in the individual patient subgroups. The benefit was most apparent in patients who were enrolled because of peripheral arterial disease and less apparent in stroke patients. In patients who were enrolled in the trial on the sole basis of a recent myocardial infarction, clopidogrel bisulfate was not numerically superior to aspirin. The CHARISMA trial was a 15,603 subject, randomized, double-blind, parallel group study comparing clopidogrel bisulfate (75 mg daily) to placebo for prevention of ischemic events in patients with vascular disease or multiple risk factors for atherosclerosis. All subjects were treated with aspirin 75 to 162 mg daily. The mean duration of treatment was 23 months. The study failed to demonstrate a reduction in the occurrence of the primary endpoint, a composite of CV death, MI, or stroke. 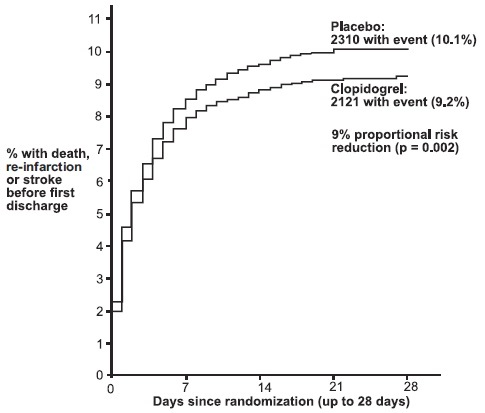 A total of 534 (6.9%) patients in the clopidogrel bisulfate group versus 573 (7.4%) patients in the placebo group experienced a primary outcome event (p=0.22). Bleeding of all severities was more common in the subjects randomized to clopidogrel bisulfate. Clopidogrel Tablets USP, 75 mg are pink colored, round, biconvex, beveled edge, film-coated tablets debossed with ‘E’ on one side and ‘34’ on the other side. Store at 20° to 25°C (68° to 77°F); excursions permitted to 15° to 30°C (59° to 86°F) [see USP Controlled Room Temperature]. Protect from moisture. 1. Clopidogrel tablets may not work as well in people who:have certain genetic factors that affect how the body breaks down clopidogrel tablets. Your doctor may do genetic tests to make sure clopidogrel tablets are right for you. Your doctor may change the medicine you take for stomach acid problems while you take clopidogrel tablets. You may bruise and bleed more easily you are more likely to have nose bleeds it will take longer for any bleeding to stopCall your doctor right away if you have any of these signs or symptoms of bleeding: unexpected bleeding or bleeding that lasts a long time blood in your urine (pink, red or brown urine) red or black stools (looks like tar) bruises that happen without a known cause or get larger cough up blood or blood clots vomit blood or your vomit looks like coffee groundsDo not stop taking clopidogrel tablets without talking to the doctor who prescribes them for you. People who stop taking clopidogrel tablets too soon have a higher risk of having a heart attack or dying. If you must stop clopidogrel tablets because of bleeding, your risk of a heart attack may be higher. Chest pain due to heart problemspoor circulation in their legs (peripheral arterial disease)a heart attacka strokeClopidogrel tablets are used alone or with aspirin to lower your chance of having another serious problem with your heart or blood vessels such as heart attack, stroke, or blood clot that can lead to death. Are pregnant or plan to become pregnant. It is not known if clopidogrel tablets will harm your unborn babyare breastfeeding or plan to breastfeed. It is not known if clopidogrel bisulfate passes into your breast milk. A decision should be made with your healthcare provider to avoid or discontinue breastfeeding when continuing clopidogrel tablets is needed.have had an allergy or reaction to any medicine used to treat your disease.Tell all of your doctors and your dentist that you are taking clopidogrel tablets. They should talk to the doctor who prescribed clopidogrel tablets for you before you have any surgery or invasive procedure.Tell your doctor about all the medicines you take, including prescription, non-prescription medicines, vitamins and herbal supplements. Purplish spots (called purpura) on the skin or in the mouth (mucous membranes) due to bleeding under the skinyour skin or the whites of your eyes are yellow (jaundice)you feel tired or weakyour skin looks very palefeverfast heart rate or feeling short of breathheadachespeech changesconfusioncomastrokeseizurelow amount of urine, or urine that is pink or has blood in itstomach area (abdominal) painnausea, vomiting, or diarrheavision changesTell your doctor if you have any side effect that bothers you or that does not go away. Tell your doctor if you develop an allergic reaction including skin reactions while taking clopidogrel tablets.These are not all the possible side effects of clopidogrel tablets. For more information, ask your doctor or pharmacist. Www.aurobindousa.com/product-medication-guidesAll trademarks are property of their respective owners.